Started in 1788, consecreted in 1794 and demolished in 1907, James Wyatt’s St Peter’s Church had 46 vaults underneath it packed with coffins. These were sealed and preserved when the church was demolished and lay undisturbed with a 1908 stone cross by Temple Moore marking the location, later joined by a stone cenotaph designed by Sir Edwin Lutyens in 1924. One famous resident of the crypt is Hugh Hornby Birley, who was reputed to have led the Yeomanry in their charge as part of the Peterloo Massacre in 1819. 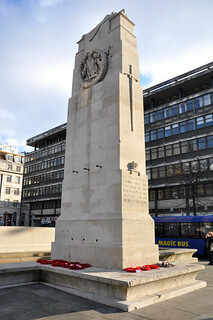 The cross and cenotaph were moved in 2015 to make way for new tram lines for the second city crossing, supported by a large concrete slab so that trams could run over the crypt without disturbing it. Read more in this BBC News article: Unearthing Manchester's hidden crypt and secret cemetery. You can see photographs of the church exterior, the interior, sealed vaults and a passage adjoining the vaults in Manchester’s Local Image Collection. You can see plenty more pictures of the church on the Manchester History page about St Peter’s. Andrew Simpson has written an article about the recent excavations in More on that hole in the ground in St Peter's Square. 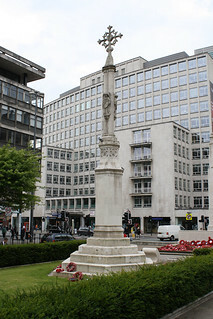 Manchester Confidential have published an article about the restoration of the St Peter’s Square Cross called A New Old Cross And Manchester's Best Square By A Mile as part of the completion of the square’s renovation, which contains plenty of history about the crypt.